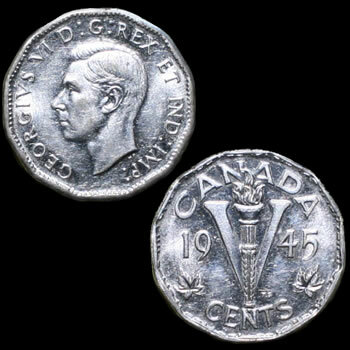 Canadian 5 cent Victory nickel with George VI on the face of the coin; "V" on the back for victory in WWII. "We Win When We Work Willingly" around the rim in Morse Code. Limit 1 per customer. Condition Good or Better. Date our choice.